Named “Sonny”, from ZheJiang University. Winner of the red dot design award in Life Sciences. 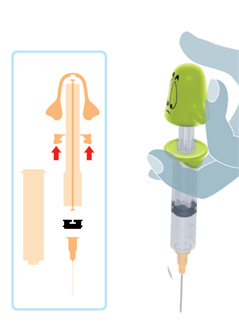 Squishing toy injection mechanism + give the kid the toy after the shot. Via Core77 via coolest gadgets. Don’t know if it will work, but I am impressed with the design and I do think this is at least somewhat indicative of China’s beginning to place more value on design than in the past.